Presented in collaboration with the European Foundation for Support of Culture, this concert is dedicated to the 115th anniversary of Aram Khachaturian. 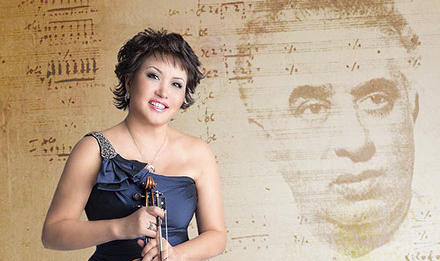 Internationally acclaimed violinist Aiman Mussakhajayeva features as soloist in Aram Khachaturian’s violin concerto in a symphonic concert under the direction of conductor Sergey Smbatyan, celebrating the music of the great Armenian Composer. During her illustrious career, Aiman Mussakhajayeva has not only been a prizewinner of the Paganini international competition in Genoa but also the Tokyo international competition; the Sibelius international competition in Helsinki and theTchaikovsky International Competition in Moscow.